Decorating the home is a Halloween Tradition that has been passed down for generations, and today, many folks go so far as to host their own Tucson Home Haunt. These Tucson Haunts become well known in the community, and are often free, or only ask for a donation. Some of the best decorations can be seen at home haunts - the passion of these Tucson Halloween enthusiasts truly shine through during the month of October, when you can see countless homes decked out for the holiday. Whether you’re looking for a good scare, or you’re simply looking to tour the best decorated houses in Tucson, make sure to check out these local Tucson Home Haunts - you won’t be disappointed. The House on Camino Mesa 548 days ago Rate Now! Tomb Town Tucson Tucson 175 days ago Rate Now! 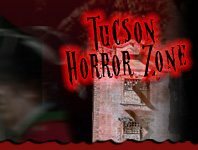 Founded in 2011, TucsonHauntedHouses.com is a simple and unique online haunted event & attraction resource created to make it easy for locals to find Haunted House, Spook Walk, Corn Maze, and other Halloween Attractions in their local area.